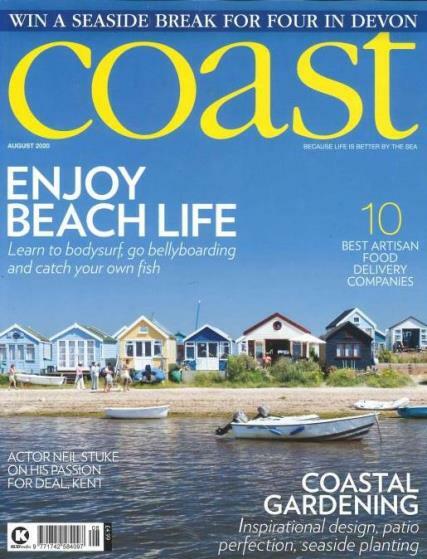 Bring the blue sky and sea breeze of the sea side into your home with a subscription to Coast Magazine. Buy a single copy or subscription to Coast magazine. Followed by £45.36 over 12 months by direct debit. It is a monthly magazine for those who think the seaside is the most blessed place on the planet. If you are looking to buy property or to set up a temporary vacation home or simply take off to the seaside for a break, Coast magazine, Britain’s number one lifestyle magazine for the coast side is your best bet! Want to experience the lovely contours of the coastline, see the sunset with your loved ones and walk through low beaches with the sand in your feet and stars in your eyes? Coast magazine with all the details of property, design and real estate news can bring you up to speed with Britain’s coastal state of affairs. With details of festivals, food, culture and lifestyle of the various coast lines and what you can expect to find at each of them, Coast gives you tips on interior design, gardening and maintaining a fantastic beach home. The beauty of the coast is represented through photographs that could easily value the cost of the magazine in itself. Coast magazine is a high quality magazine with spectacular photography and articles. It comes with great recipes covering local seafood cooking. It is a gift and the recipient is very happy with the magazine each month. Beautiful magazine , so informative. very good price to try this magazine. Love the British Coastline and this magazine gives you a sense of actually being there. love this mag. everything stops the morning it drops through the door! Love the photography and the variety of articles. Always informative and reveals new places to me in an interesting way. Generally like very much. Occasionally interior design pages can be extremely gloomy and depressing. Also have to search very hard to spot item in photo e.g. vase and compare details of item in list. And often hardly enough of item visible to make worth mention.Just manages balance across the country and not just Devon/Cornwall. I bought this for my daughter-in-law who loves the magazine as she enjoys the outdoor life especially around the coasts of Britain. Love the style, articles, adverts, everything! It is a dream to live by the coast, so at the present time, what better way to lose yourself than through the pages of Coast. I like the different variety of articles that you get each month and I think this caters for everyone. Some months there is loads that appeals but other months not so much. I love the photographs. Few too many adverts but I suppose that is a sign of the times. I read and re-read each issue as they make me happy. Only discovered this magazine a couple of months ago, I'm really interested in the coast of our country in particular piers and lighthouses. Superb magazine, like it all. I like everything about it. Would actually like more adverts for coastal 'design' goods suppliers. Do an arts and crafts section specifically for people to recreate some of the products illustrated. I subscribe to COAST as it is a delight each time it arrives with its colourful arresting cover and cover headlines that transport you to being on 'holiday'. It has stunning photography of the coast evoking many memories. It introduces you to new coastal areas and sports e.g. coasteering. I love being able to dream about buying a coastal property up for sale or visiting /experiencing somewhere/something new. Sometimes those dreams become reality. There are lovely items to window shop or buy. Competitions to enter. Lifestyles to read about e..g. Helston ferry man it is not an age specific magazine enabling me to pass it on to others e.g. friends, clients, family to enjoy.